We have several aluminum mount blocks which are designed to accommodate our ILDH-4A-90 and ILDH-4A-180 hinges, as well as some Soss-type hinges (manufactured by other companies). The MB-4A Mount Block allows you to insert the hinge into the mount block and secure it with mounting screws. 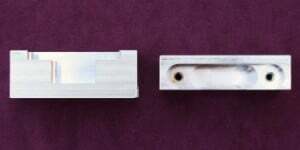 The cut-out is centered in the mount block. The MB-4A-NS is very similar to the MB-4A, but differs because the cut-out is not centered but is offset to one side. The “near-side” wall is about 0.015″ inches thick. The MB-4A-TS(HC) is also similar to the MB-4A, but now one wall of the mount block is basically removed and the hinge itself becomes the side of the mount block. This mount block also uses heli-coils to secure the mounting screws. The MB-6AH, MB-6AL, and MB-6ATS(HC) are mount blocks which accommodate larger Soss-type hinges made by other manufacturers.